A couple of months ago, I ironically pointed out the Wenatchee's bad policy process was something Olympia avoided almost ten years ago now. The Hotel Olympia, from the UW Library. But, if we go back over 120 years to right about the time of statehood when the city was desperately trying to hold onto the capitol, we see a much different decision from Olympians. Not only did we build that thing (in this case, the Hotel Olympia) but we avoided using public money. Over 70 percent of the cost of the hotel (over $2.5 million today) came from local investors in the Olympia Hotel Corporation. The other 30 percent came from a loan taken out by the corporation. The shortcoming's of Olympia (and Thurston County) of not having a true conference center was, if I recall correctly, one of the driving arguments in 2003, and again recently. 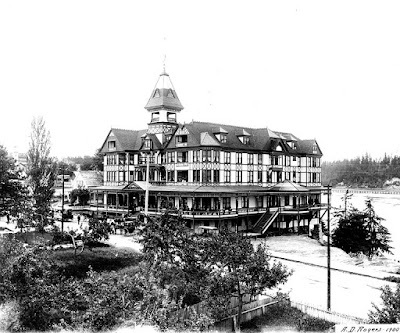 The hotel was located just south of today's Governor Hotel on Capitol Way between 7th and 8th, with its back up to the old Deschutes waterway (or Deschutes River estuary) which had not been filled in yet. And, not unlike Wenatchee's Toyota Center, the Hotel Olympia, quickly fell upon hard times. According to Newell in Rogues (again) by 1894 the city forgave the hotel its tax burden in order for it to stay afloat. A year later, the mortgage on the last 30 percent came due and the Olympia Hotel Corporation went bankrupt, closing the hotel's doors. At this point, city officials went hat in hand (Wenatchee style) to the governor. In the case of 1890s, Olympia's city leaders didn't want a straight bailout, but rather a jump start of the local economy by finishing the incomplete Flagg capitol. The Hotel Olympia has an interesting history behind it. It looks beautiful too. How great it would be if it is still standing now.